One approach to thinking about the minimum amount of income a household needs in order to live sustainably and decently is to use consensual budget standards, such as the Minimum Income Standard produced by the Centre for Research in Social Policy (CRSP), Loughborough, work which is funded by the Joseph Rowntree Foundation. This uses a transparent and consistent methodology, drawing on what ordinary people think is essential for living in society at a particular time. It provides budgetary estimates of weekly income needed to meet consensually defined essential expenditure for 11 different household types. The budget, uprated annually, has recently been re-examined to establish what people saw as 'essential' in recessionary times. Every year, each component budget list is checked by relevant experts so that it meets any statutory recommendations. (Note that the food costs applied are those of a typical major retailer, which not all poorer households can access). The figures produced can be compared with, for example, social security benefits or national average wages, to see how far these match needs. The latest findings show that neither UK social security benefits nor the UK National Minimum Wage are sufficient to enable households of different sizes and compositions to meet the costs of a consensual minimum acceptable standard of living, except perhaps average pensioner households. While people might quibble with some of the components of 'acceptable' living standards, although they are fairly parsimonious, they cannot truly argue with the food budget, which matches consumption patterns of the lowest decile in the UK national annual Family Food Survey adjusted to meet nutrient requirements and healthy dietary guidelines (such as 5 daily portions of fruit and vegetables)(download paper). The implication is that people do not have enough money to buy the minimum diet required for health; people usually prioritise expenditure with significant consequences for default (such as rent, local taxes, fuel) over food, consequence for whose lack or inadequacy is borne in the body and personal condition. 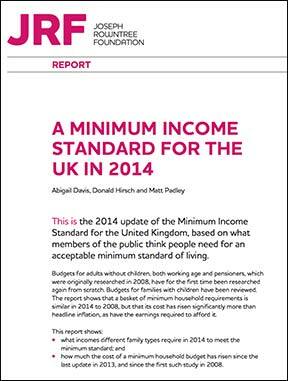 Davis, A., Hirsch, D. and Padley, M. (2014) A Minimum Income Standard for the UK in 2014, York: Joseph Rowntree Foundation. This work, funded by the Joseph Rowntree Foundation, is a way of costing what a realy ‘minimum income standard’ that took account of the realities of people’s lives, would look like. You can read about the methodology here. Elizabeth Dowler, a public health nutritionist, is emeritus Professor of Food & Social Policy in the Sociology Department at the University of Warwick, Coventry, UK. She draws on science and social science in working on food poverty, security, rights and justice; local food initiatives; policy evaluation and ‘reconnection’ to sustainable food systems. 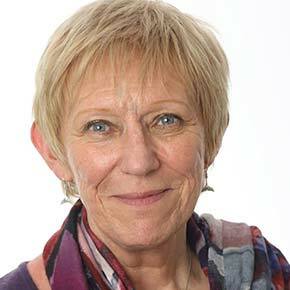 Liz is a member of DECC/Defra’s Social Science Expert Panel, and was previously on Defra’s Council of Food Policy Advisors. In 2014 she was a member of the External Expert Ex-Post Evaluators for Framework Prorgamme 7 Food, Agriculture, Fisheries and Biotechnology for the European Commission. She is also a member of the Iona Community, a dispersed Christian ecumenical community working for peace and social justice. She does brief international consultancies evaluating food policies and previously worked in the global South, often for international agencies, and was based at the London School of Hygiene & Tropical Medicine. Her recent books, with colleagues, include: Reconnecting Consumer, Producers and Food: exploring alternatives (2008) Berg; Challenging Health Inequalties: from Acheson to 'Choosing Health' (2007) Policy Press; Welfare of Food: rights and responsibilities in a changing world (2003) Blackwellls; Poverty and Social Exclusion North and South (2003) Routledge; Poverty bites: food, health and poor families (2001) Child Poverty Action Group. Elizabeth Dowler is currently not available for follow-up via the internet.